Each player starts the game with a certain number of turns. 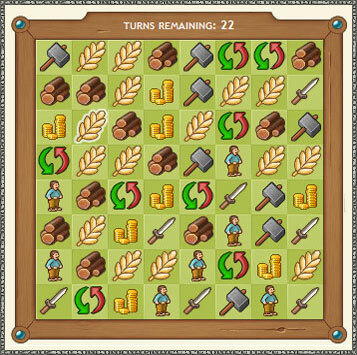 Each turn consists of swapping two adjacent icons in the production grid in order to align three identical icons, creating the corresponding resource. On each turn you will click between two adjacent tiles which will cause them to switch places. When you successfully line up three identical icons, you will receive the corresponding resource. You start the game with 100 turns and receive an extra one every 30 minutes. Tip : If you align more than three icons in a row, your rewards will be greater, e.g. you'll produce more food. Famine : If you don't have enough food to feed your population, they'll start to die of starvation! If this starts to happen, you'll need to recruit more peasants and make them work harder to restore your food stocks. If there are no possible moves on your production grill, it will be reset automatically with new icons.